Got Blues If You Want It! at Åmål's Blues Fest '98. Mr Bo & The Voodooers. But Mr Bo's avid interest in the blues has not only resulted in wailing blue notes and gruff soul vocals but also in writings on blues for the Swedish magazines 'Musikermagasinet', 'Fuzz', 'Showtime' as well as the daily paper 'Göteborgs-Posten'. Plus a series of radio programmes on the P3 channel. And an appearance as blues authority in a debate on black music at the annual Book Fair in Göteborg some years ago. And propably a lot more! 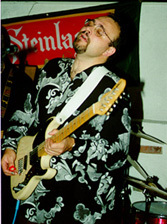 Mr Bo & The Nightcats played at Hardy's, Kalmar, November 1995. So you would like to contact this gent? Please try bo.carlsson@vgregion.se! Nightcats Enjoy the cover art of the two Nightcats albums!